For smaller leagues and organizations, stock awards make a lot of sense. We can ship them quickly and offer customization and engraving services. 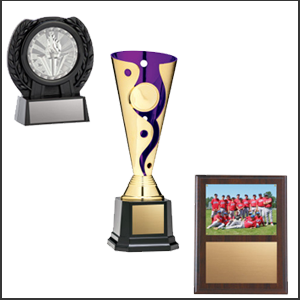 We supply medals, ribbons and trophies for any sport imaginable. Due to the massive inventory that our supplier offers, we ask you to check out their online catalog. Another window will appear. Make a note of your selections and inquiry below or call us at 1-866-661-9696. We will ship anywhere in Canada.